The Electronic Blue Bug is nocturnal and eats shattered computers. The Flower Back Shiny Head Beetle can fly without wings and drinks nectar. And the Laser Bug comes from the depths of Amazon Prime. These are a just a few of the not-so-creepy creatures second graders conjured up in art class. Each student used collage materials to create a three-dimensional imaginary insect for their class's specimen box. 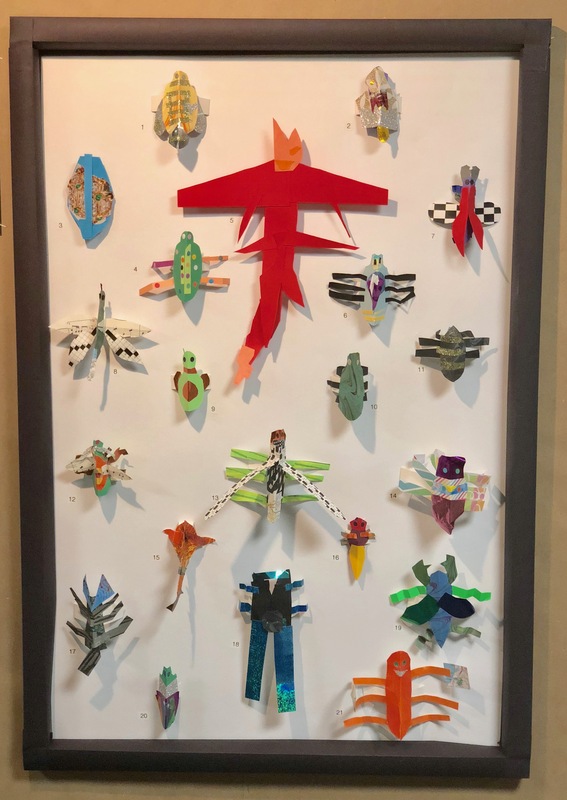 The insects had to have parts that all insects share (abdomen, thorax, head, legs), but students were encouraged to be as creative as they could imagine in these small but complex sculptures. This activity followed a collaborative art-science project in which the class created observational drawings of actual insect specimens. The students worked hard to capture the details of the insects in line before using colored pencil techniques to add color. Find photos and fun facts of all the imaginary insects on Flickr.